When Harriet was born, without even realising it I had a wave of ‘relief’ (I think that’s what I would call it…) roll over me. Eleanor had a sister. I didn’t realise how much I wanted a sister for Eleanor until she was here. A girl! Girls! Mum of girls. For the next few days while I was in hospital, my head filled with ideas of a shared bedroom, of tea parties and fairy dancing, of teenage dramas and stolen clothes, and a dutiful bridesmaid holding the wedding dress up going to the toilet one day. 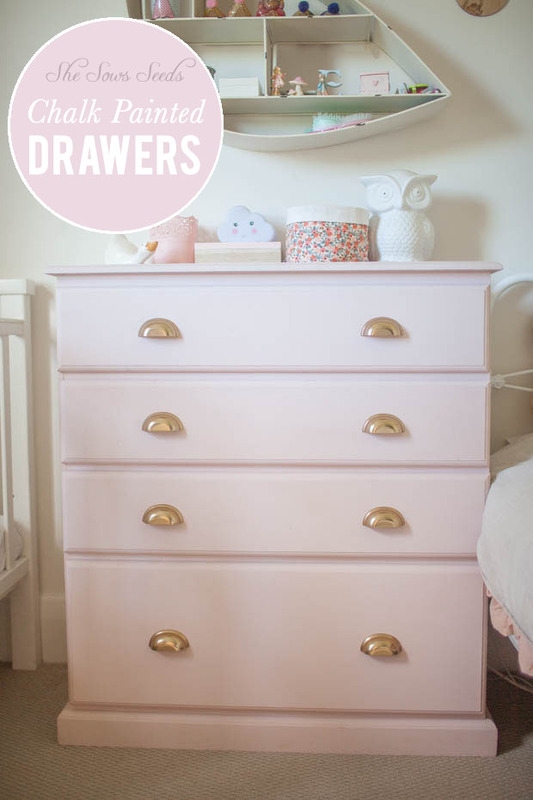 Thoughts also wandered to that chest of drawers I’d been meaning to paint for the baby’s nursery… the nursery which was very unisex, very gender neutral, very grey and white and in need of a punch of either strong navy or soft blush pink. Now, it was going to be the latter. 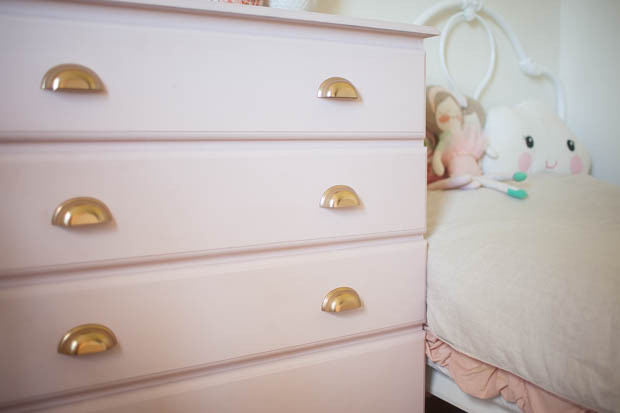 Gimme allllllll o’ the blush pink! 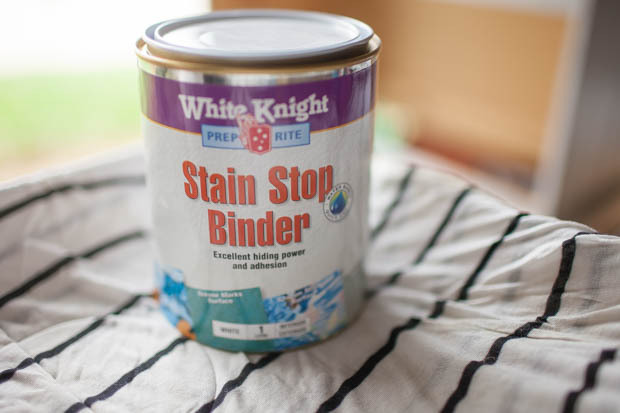 I started with the White Knight ‘Stain Stop Binder’ – as advised by the friendly Bunnings paint lady after I told her the drawers I intended to paint blush pink were in fact currently a very dark stain. 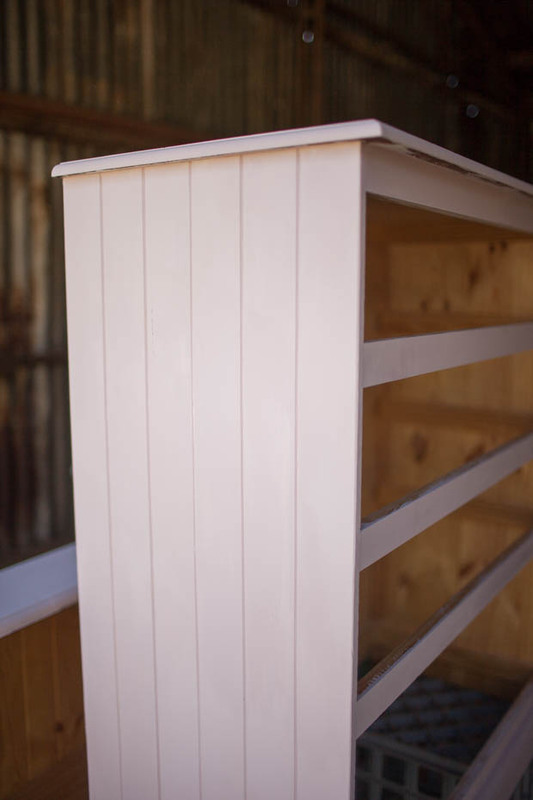 I didn’t particularly fancy doing a tonne of sanding back (although we do have a belt sander which makes the job a heck of a lot easier – I did once sand a wardrobe in the shed on consecutive 40 degree days, not recommended! 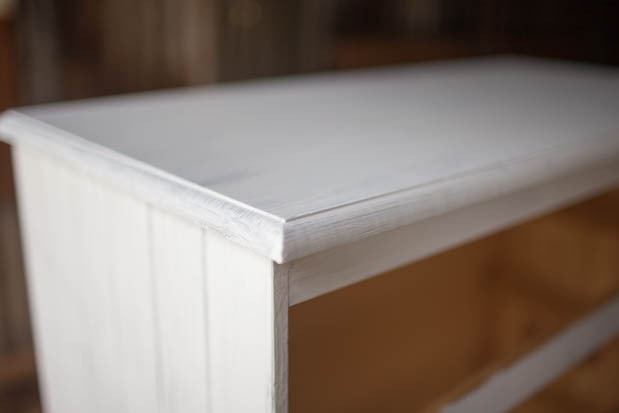 Far out, thought I was going to die…) I fairly lightly sanded the drawers back to begin with, not with a sander, just some elbow grease to rough up the surface a little for best sticking power. I ended up doing two coats of the stain blocker. 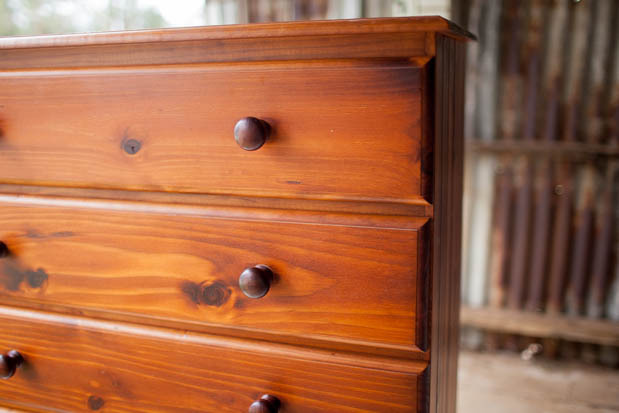 One was looking pretty good, but I thought better to be safe than sorry – and did another coat. 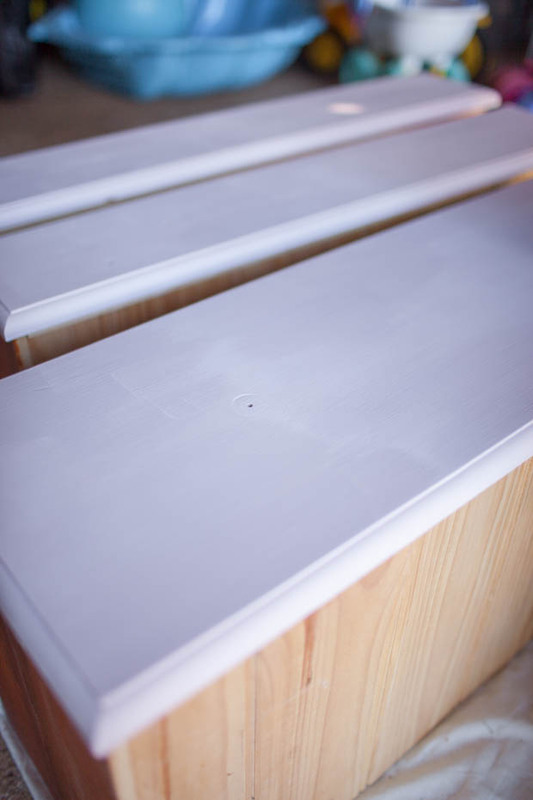 I thought I’d rather two coats of stain blocker and not have the dark stain showing through underneath, than more and more and more coats with the pink chalk paint to try and hide the dark stain. Next came the fun part – colour! 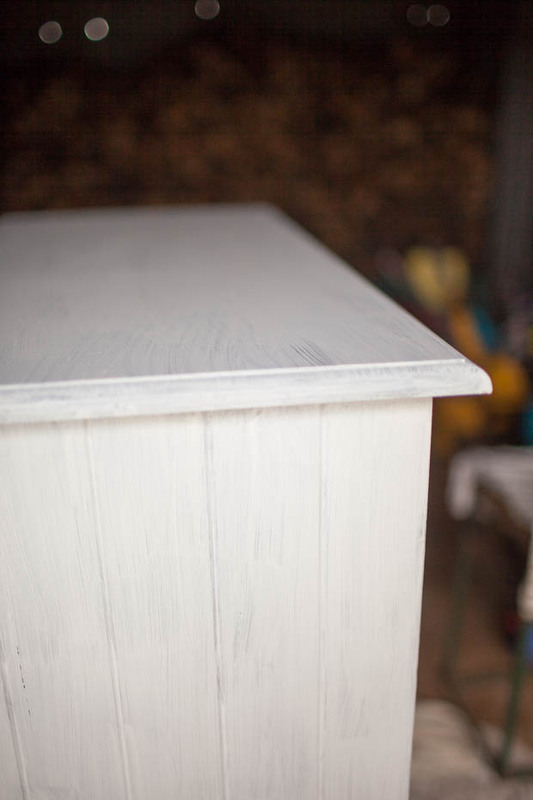 This was my first foray into chalk paint, and it does give a lovely soft and subtle ‘chalky’ finish (funny that…) I was surprised it was no different to ordinary paint to go on, I don’t know what I was expecting, but considering that the finished product gives a different textural experience, I figured that the paint product may be different to apply – but, nope. Same same. 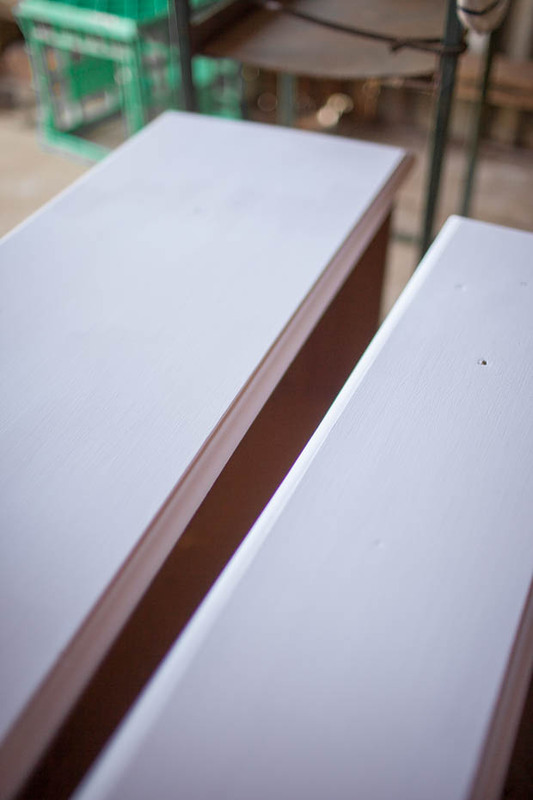 I did three coats with the Rustoleum ‘Chalked’ product, the third and final coat was probably not entirely necessary but I had left it a bit long in between coats and there was some water droplet marks from rain blowing into the shed – oops! 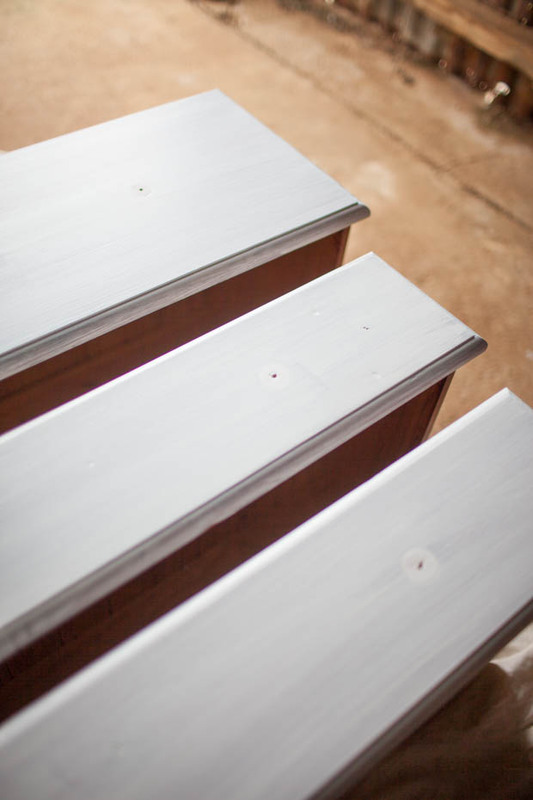 So another coat just helped to put the finishing touch on. 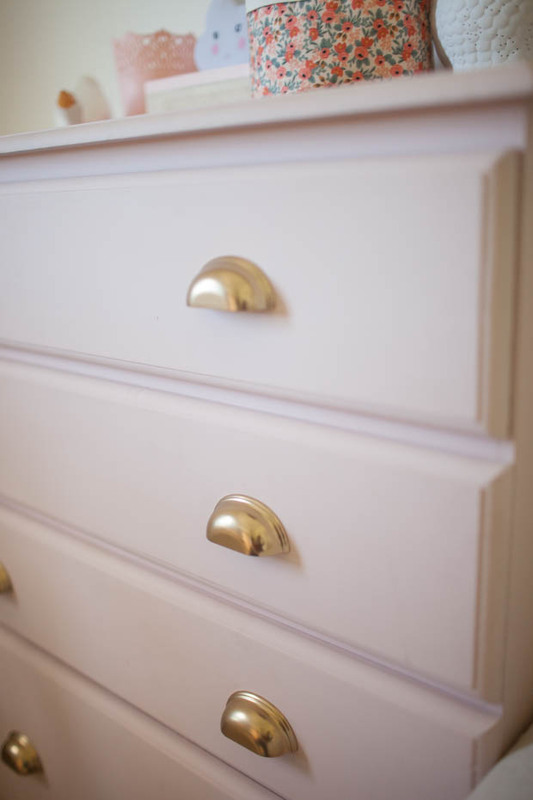 If my drawers weren’t such a dark colour to begin with, or I was using a darker colour other than blush pink, I think two coats would have been sufficient (with the stain blocker underneath). Oh yes, I had a little Picasso helper too. 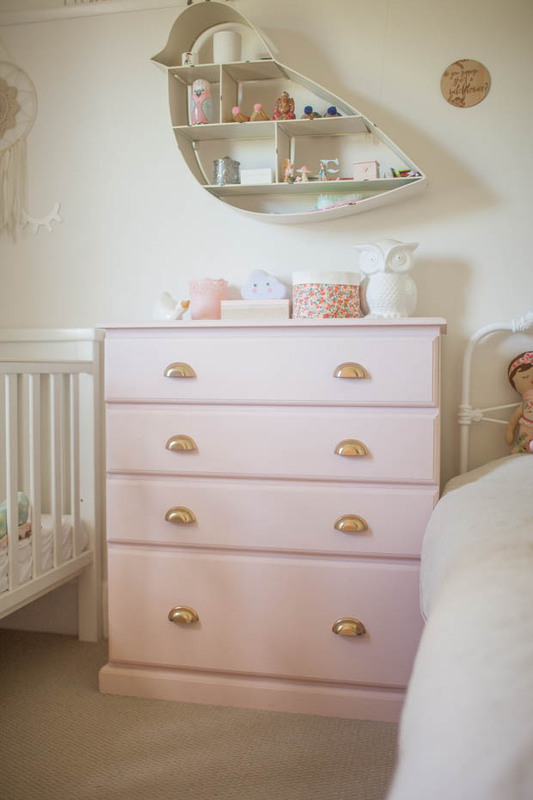 Another advertisement of why you should definitely do this sort of thing when you have a sleepy newborn and a toddler who still naps… except Harriet was never a sleepy newborn, hence why I was undertaking this ‘baby nursery project’ when she is in fact almost two years old! 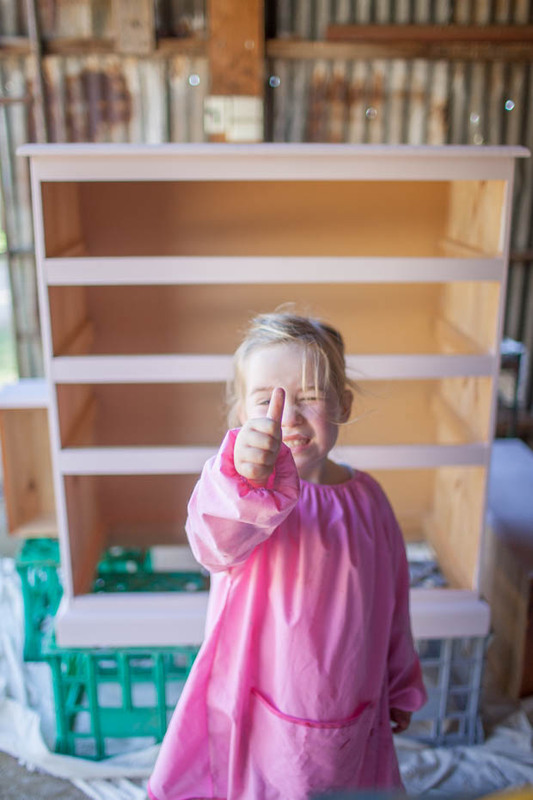 But for anyone who has tried painting furniture with an arts and craft loving three year old in tow…all power to you. Hard liquor is recommended! 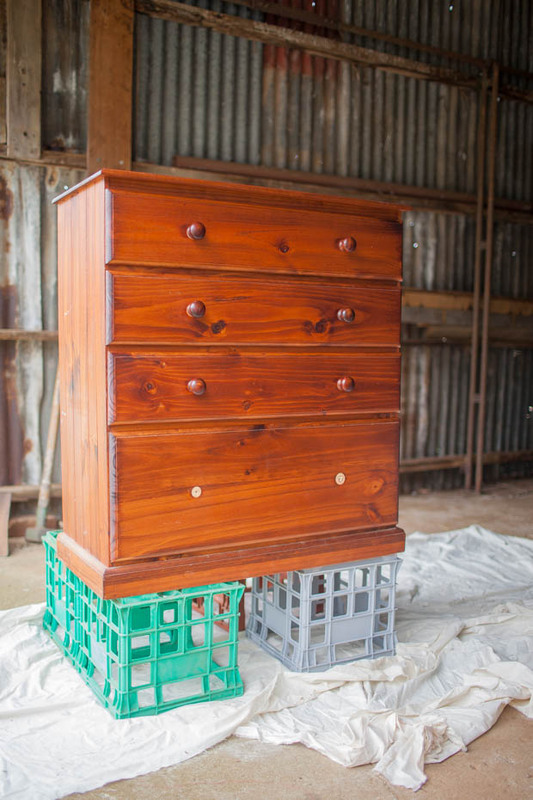 The drawers, though? 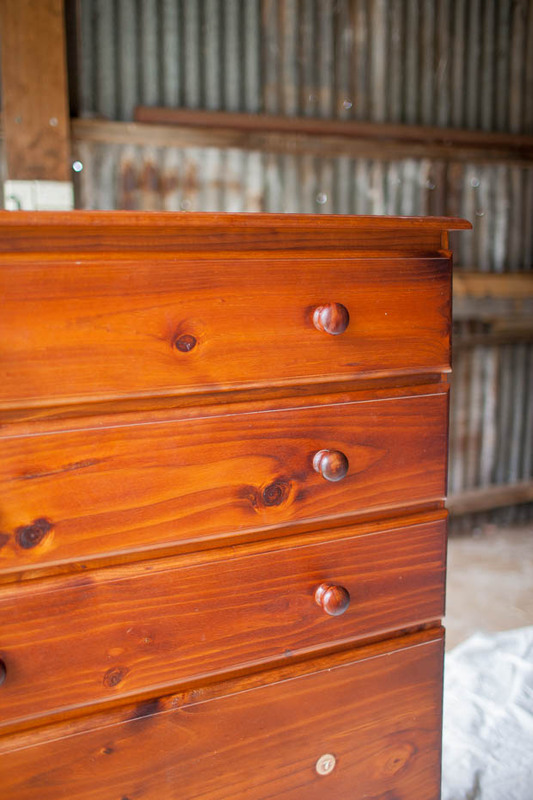 The drawers! They turned out beautifully – better than I expected. 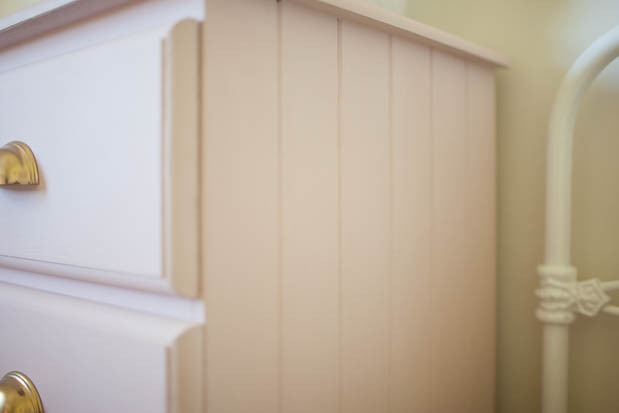 The chalk paint is just the softest, loveliest tone to add to the girls room – perfectly pretty without being too sickly sweet. 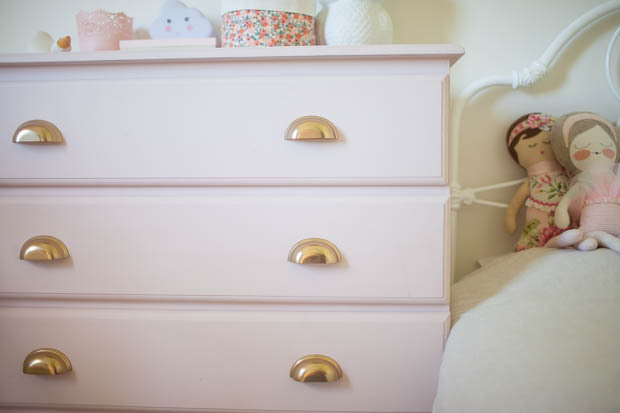 Matt was all *eyeroll emoji* when he sighted that I wanted to paint the drawers pink. 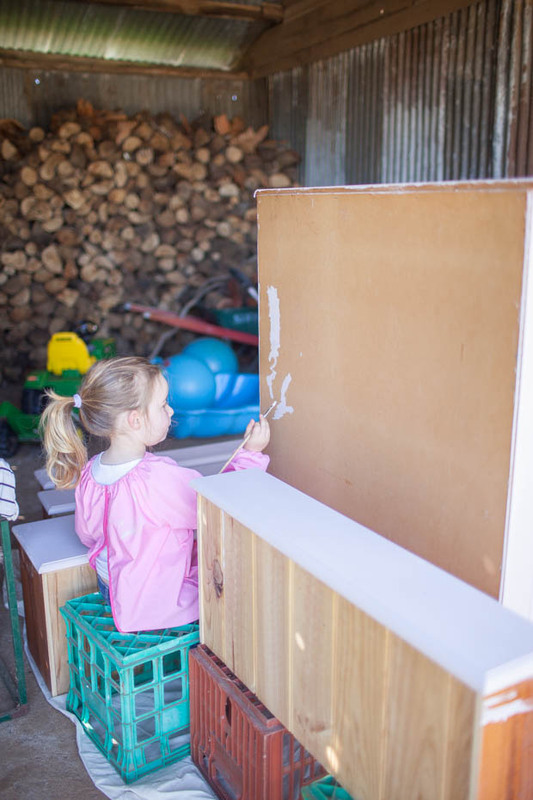 But when he poked his head around the corner of the shed to check on progress he actually commented it was a very nice shade of pink. Oh what’s that? Good job, Emma. I think that’s what I heard. 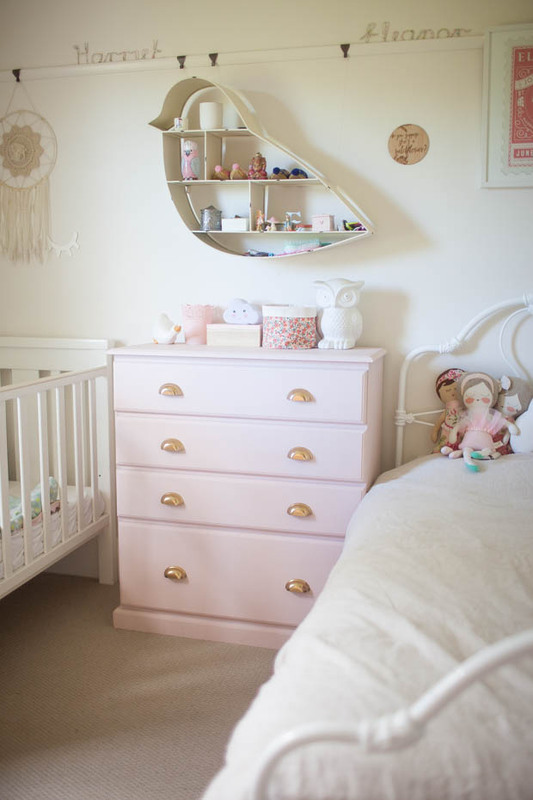 The drawers sit perfectly between Eleanor’s bed and Harriet’s cot, no need for bedside tables (although I’ve had to move things away from Harriet’s cot side as she pulls everything in to sleep with her!) And the extra storage is brilliant, but truth be told with a wardrobe overhaul and re-shuffle, that big bottom drawer is completely empty! 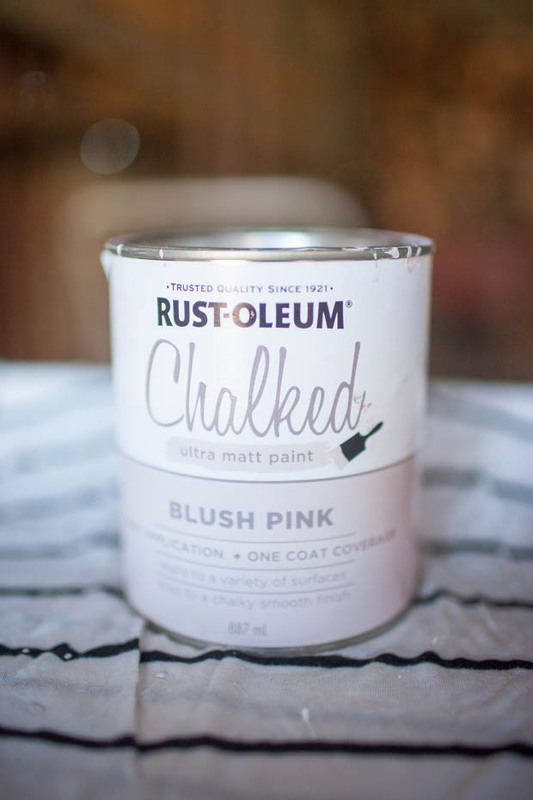 Have you dipped your toe into the chalk paint game? Got a project that’s been bouncing around in your head since you were in hospital with a newborn baby? Got a husband who has had quite enough of the pink exploding out of every crevice of the house?! 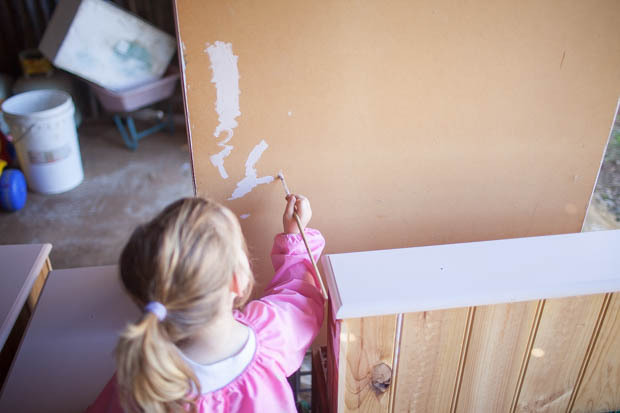 Now, with paintbrush in hand, I’m looking around the house at all manner of furniture – nothing is sacred! A project since before he was a babe in my arms … his entire nursery and more specifically his cot quilt and mobile and now he is nearly 15mths old 😱. Also a very awake, screamy newborn. It is a pretty shade of pink. I do love timber furniture but I think this suits a lot better plus it is another way to add girly while keeping the base of the room neutral. You could teach those hour rules contestants a thing or two. Hard work when you moved when you were heavily pregnant/newborn?! I never made the Liberty and linen cot quilt I had planned for Eleanor…and now I’d have to make a single size – yikes!